The New Orleans based MUTEMATH is one of those bands that I hear about all the time, but didn’t know much about them. A little while back I thought I’d take a little bit of time and look a little closer at the band to see what they’re all about. The friends that like them, like a variety of genres of music and I would loosely categorize this band as alt rock band leaning towards that super catchy/poppy side of things. Lots of keys/guitar mix and drums that sound electronic. When listening to this band you immediately get in the groove. I definitely can see why people can get into this band. Okay.. the first thing that grabbed my attention was the fact that Roy Mitchell was not using any amps. This is the second time I heard reference of Palmer DIs being used in live situations. The first I heard of this was from the recent Cure World Tour. Both Reeves Gabrels and Robert Smith had amps on stage, but none of them were mic’d. I asked Reeves about this and he said that they used Palmers to route signal to Front of House. The amps were just for stage volume. All I know, is that the Palmer signal getting blasted to the crowd – sounded amazing. As always, if you see anything incorrect or missing – or just want to talk about MUTEMATH, please comment below. Love to hear your thoughts!!! Rattlesnake Cable Company Give Away - the winner is..Flex Reaction - Compound 44 Give Away! 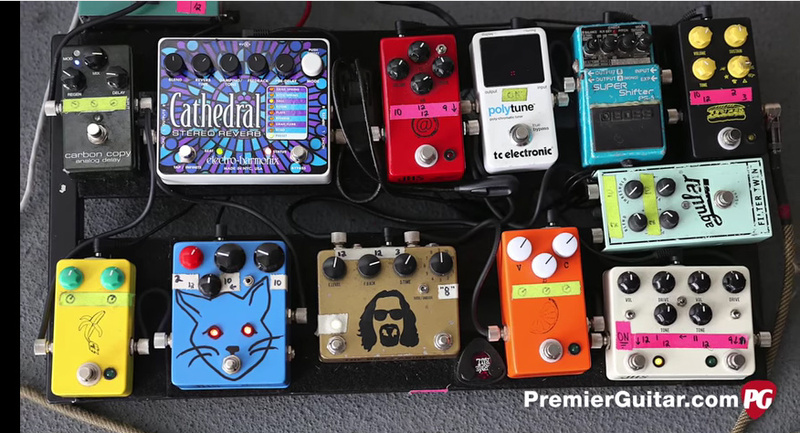 You’ve got to add the JHS modded tremolo, side-mounted to Todd’s board.